American professional baseball pitcher Clayton Kershaw is known as the starting pitcher for the Los Angeles Dodgers of Major League Baseball (MLB). Kershaw has also been named MLB All-Star seven times, including NL MVP once and has won numerous other titles and awards. Off the field, Kershaw is an active participant in volunteer works where he acts as a social activist along with his wife. The father-of-two perfectly maintained his social status keeping his career aside. Let's take a ride in Clayton Kershaw's married relationship including his contribution to the society. The American born pro baseball pitcher Clayton Kershaw is married since 4th of December 2010. Kershaw took a big step in his life vowing "I Do" with his longtime girlfriend turned spouse Ellen Melson. MLA's Los Angeles Dodgers star is blessed with two children with his gorgeous wife. Clayton Kershaw and his wife Ellen during marriage photoshoots. The duo walked down the aisle in Dallas Texas' Highland Park Presbyterian Church and later their reception took place at Royal Oaks Country Club. Moving back to the time, Mr. and Mrs. Kershaw started dating back in 2003. Reportedly, they were both in their high-school senior year while they started their lovey-dovey. "I would say we got closer when she went to college and I started playing professionally. We both kind of figured out stuff on our own. I think that really helped our relationship now. As for when she became the one? I really don’t know. I guess somewhere late in high school or early college." His future first also had the same thoughts. She explained that she realized that they were made for one another when they were apart. "We both realized our lives were so much better when we were together than when we were apart. We could accomplish so much more; with my passion for Africa and Clayton heading into his career in baseball, it felt like the Lord was up to something pretty cool with both of our passions." Kershaw never fears to speak openly about how he made his dreams come true marrying his high school sweetheart. Clayton and Ellen's love story is nothing less than a fairy tale! Above all, Clayton often speaks about their blissful relationship; their marriage is the most amazing thing ever for the two. And yes, their two children; Cali Ann Kershaw, 4, and Charley Clayton Kershaw, 2, are cherry on the top of their relationship. As of now, there are no misunderstandings and extra-marital affairs that may deteriorate their living relationship. As a true husband and wife, an in faith, their bond counts onto the few who vowed with blessing to remain of each other forever. Well, we just wish a happy future endeavor to this lovely couple and a long life journey hoping to hear more positive and good news! Clayton and Ellen launched "Kershaw's Challenge" and also wrote the book Arise: Live Out Your Faith and Dreams on Whatever Field You Find Yourself to raise money to build an orphanage in Zambia. Helping underprivileged children in Africa was always a passion for Ellens that finally became true via the organization. Day made! Love this photo of some awesome @jklivinfoundation students! Head over to their Instagram to see the impact @jklivinfoundation is making for students in the community of Los Angeles. Prior to the 2011 season, Clayton visited Zambia with his sweetheart as part of a Christian mission organized by "Dallas-based Arise Africa". Kershaw’s Challenge is committed to transforming the lives of children, in America, Africa, and the Dominican Republic, through Jesus Christ. Our goal is to partner with organizations that are committed to this as well, and work alongside them on specific projects to make life better for children. After the short trip, Kershaw announced his dream of building an orphanage in Lusaka, Zambia. He named the campaign "Hope's Home" after 11-year-old Hope, an HIV-positive child Kershaw met in Zambia. That's how Kershaw's Challenge started in 2011 with Hope. To accomplish this goal, the starting pitcher pledged a donation of $100 per strikeout recorded in 2011. With Clayton's then-career high of 248 strikeouts thrown during the 2011 season, he manages to donate $492,300 out of his $70,000 goal. Above all, when he won the "2011 Players Choice Award", Clayton donated a whopping $260,000 to Hope's Home. Most importantly, for his work, Kershaw has been honored with the Roberto Clemente Award and the Branch Rickey Award. Clayton Edward Kershaw was born on March 19, 1988, in Dallas, Texas, United States. The 31 years old player stands with a fair height of 6ft 3 inch weighing 103 kg. In 2014, Kershaw raised funds to pay for 170 children's surgeries and new medical equipment for CURE hospital in Lusaka. Kershaw and his wife is the proud author of their book Arise: Live Out Your Faith and Dreams on Whatever Field You Find Yourself. 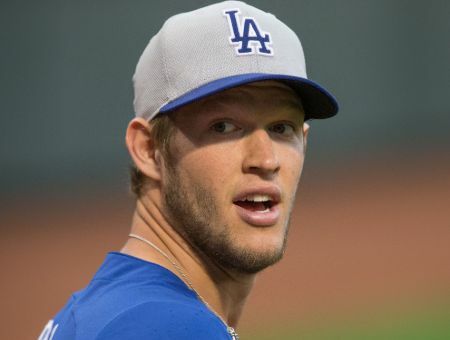 As of 2019, Clayton Kershaw's estimated net worth is $31 million.